Day 1: combine 1 oz flour with 2 oz pineapple juice. Stir together and leave at room temperature for 2 days, stirring three times per day. Day 3: add 1 oz flour and 1 oz pineapple juice to the Day 1 mixture. Stir together, and leave at room temperature until it becomes frothy and bubbly, stirring three times per day. The idea is that the pineapple juice prevents the bacteria leuconostoc from taking over, and the stirring prevents the mixture from getting moldy. The next step is adding 2 oz flour and 1 oz water, leaving for 1-2 days and stirring intermittently. Then adding 3 oz flour and 1 oz water to 4 oz of the previous culture, at which point you let it ferment and then it is ready to become your Mother Starter. So today is day 4 and I am delighted to report that my goop is starting to bubble! It is delightful to be bringing a new starter to life. It holds the promise of amazing tasting bread to feed my family. The promise of not having to go out and buy bread because I’ve just baked up a couple loaves. Just the smell of sour yeasty goodness makes me verklempt. (Really. I get choked up very easily). Now, if only I had thought of doing this at the beginning of winter instead of the beginning of summer! I have never had much luck in starting my own starter, although there are many books and websites that practically guarantee success. I was lucky enough to have been given some starter years ago that a co-worker of my mom’s brought back to Sudbury from a bakery in Ottawa. I was living in Montreal at the time, so it was quite the journey for this little lump of single-celled organisms! I did take a sourdough course in Toronto several years ago, and most students in the class were able to get a starter going, so I have faith that it can be done. I will do my best to summarize the guidance on starting a starter, and then tell you how I keep my starter going. Then I will list some resources that I have relied on over the years when I get stuck. A starter, also called “barm” or a “mother”, is the mixture of flour and water and yeast and bacteria that you keep around to use to start your breads. Most starters are wet, with a 50-50 mix of flour and water; however, some people prefer to keep a “firm” starter that is more like bread dough. I keep mine wet using a 50-50 mix of organic bread flour and tap water. If you do a Google search, you will find lots of “recipes” for starting a starter from scratch. You will see additions ranging from honey, milk or grapes, to commercial yeast. I don’t think you need any of these. The yeast and bacteria you want live either in the air around you, or in the flour you buy (depending on what you read), so these additions are unnecessary and may lead to some pretty gross concoctions after leaving them sit on your counter all day. Also, sourdough yeast is a different animal than the commercial yeast you buy, so that won’t work–I promise. Most instructions for catching a culture instruct you to leave a large bowl out on the counter with a mix of flour and water, with strict timing for refrigerating the mix, dumping out half or more, and adding more flour. – stir vigorously and fan some air across the mixture, then let sit for 24 hours in a warm place (80 – 85 degrees F). Fan, mix, then fan again after 24 hours, and let sit again for another 24 hours. – once 48 hours has passed (since the beginning), remove 1 cup of starter and add 1 cup flour and 1/2 cup warm water. Stir it in vigorously and then continue as above. – you will continue this 48-hour cycle until it is clear that bubbles are forming in your mixture. This may take anywhere between 3 and 8 days. – once bubbles start appearing, pat yourself on the back–you have caught a starter! Now you will treat your mixture like “new starter” and follow the instructions below. New starters can be very unpredictable, and will take anywhere from 1 week to 4 weeks to become hardy and abuse-resistant. Make sure to take good care of them during this stage. Most recipes call for cups and cups of flour and water, most of which gets thrown out, for no good purpose at all. I keep a very small amount of starter, around 3 oz max, unless I am baking with it and then I will increase it to what I need for my recipe, plus 1 oz to work from next time. However, I can also work with less. I have also revived my good ole starter many many times. Usually what happens is that I take a break from baking and my starter sits in the fridge, sometimes for months, slowly drying out into a hard puck in the bottom of a drinking glass. 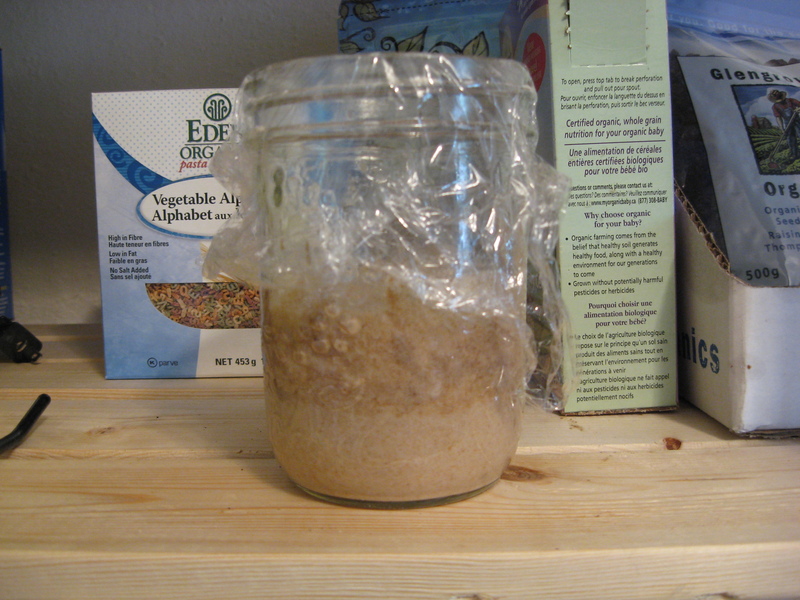 – use 1 tablespoon, or even 1 teaspoon, of your “dead” or “barely living” starter. This refers to either new starter that HAS shown some life (bubbles) previously, or old starter that used to work but seems dead at present. – in a drinking glass, add starter, 1 oz flour and 1 oz lukewarm water, and let sit, or “proof” for 24 hours in a 72 – 77 degree F environment. Then check for bubbles. If the starter looks “healthy” (see the Starter Doctor for these definitions), you’re good to go–time to make some bread! – if your starter is still “dead” or “barely living”, refrigerate for at least 12 hours and then follow the above procedure again & again until the starter is “healthy”. This WILL work–it just takes some time. You can also try different flours to see if you get different behaviours. There are lots of resources here, from the rec.food.sourdough newsgroup. The newsgroup is hilarious to read but they can be very mean to “Newbies”. Lurk awhile and you will pick up more info about Sourdough than you ever needed to know. Also try baking911.com for all sorts of amazing baking tips. Here is their Sourdough section. Now go and make some bread. And remember, if you’re not quite confident that your sourdough will really rise, you can always add 1-2 tsp of yeast to the mix and follow conventional rising times (1 1/2 to 2 hours first rise, then form into loaves and let rise 60 to 90 minutes before baking). It won’t leave enough time to fully develop the sourdough characteristics (full flavour, sourness, chewy texture), but it can be a way to ease yourself into the Sourdough frame of mind. Good luck!